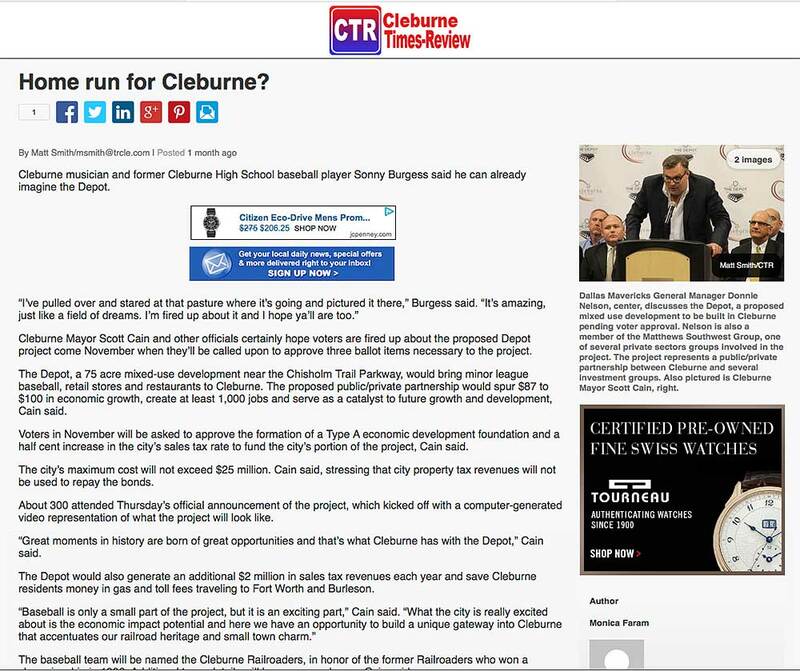 Cleburne Mayor Scott Cain and other officials certainly hope voters are fired up about the proposed Depot project come November when they’ll be called upon to approve three ballot items necessary to the project. The Depot, a 75 acre mixed-use development near the Chisholm Trail Parkway, would bring minor league baseball, retail stores and restaurants to Cleburne. The proposed public/private partnership would spur $87 to $100 in economic growth, create at least 1,000 jobs and serve as a catalyst to future growth and development, Cain said. Voters in November will be asked to approve the formation of a Type A economic development foundation and a half cent increase in the city’s sales tax rate to fund the city’s portion of the project, Cain said.